Make your way along one of Northern Ireland’s most scenic drives, following Lower Lough Erne. Lower Lough Erne is fringed by woodland growing on the shore, which is a haven for numerous species of birds and wildlife across seasons. See how many Islands you can count and you make your way down this picturesque route, legend has it that there is one for every day of the year! Take a detour to visit Lough Navar viewpoint , a must see when in this area! This spectacular forest extends across 2,600 hectares of bog, heath, open water, native woodland, and forest. Enjoy a breath-taking scenic 10km drive meandering through a canopy of leaves leading to one of the best views in Ireland. Take in views of Lower Lough Erne and on a clear day the Sperrin Mountains and West Coast of Donegal. If you’re a keen walker there is also a network of walking trails to explore and endless hidden gems and picturesque spots to take stunning photography. Indulge in a little culture and experience the highly popular Belleek Pottery Visitor Centre Tour. When you step into the world of Belleek Pottery you step back in history. The museum contains pieces dating back to when the pottery was started in 1857! Guided Tours last for 30 minutes and begin from 9.30am until 12.15pm with 12.15 tour being the last tour before lunch break. Tours begin again at 1.45pm to 4pm with the final tour of the day being 4pm Monday - Thursday and 3pm on Fridays. Belleek Visitor Centre also houses a lively Tea room which is ideal for a tasty treat or Lunch, or alternatively, why not stop in at ‘The Thatch’ in Belleek Village. This cosy little thatched cottage is Belleek's oldest building (late 18th century), with the original rafters visible above an old church bench on the back wall! With a cosy and welcoming atmosphere and delightful homemade food, this is another great option for Lunch. Open Monday – Saturday 9am-5pm. Drive on to Mullaghmore and the Mullaghmore Head, a beautiful viewpoint along the Wild Atlantic Way. Mullaghmore is a small fishing village and holiday destination with a beautiful sandy beach and a pier, The ferry for the magical island of Inishmurray departs from here. If you have time we recommend venturing out into the Atlantic for an excursion to this quaint Island or for a sea angling trip. Once past the town, you will find yourself within a picturesque scenery: Huge waves roll ashore, and looking inland, a magnificent view on Classiebawn Castle and panoramic views of Sliabh Liag. Mullaghmore Head is the perfect example to display the wonders of the Wild Atlantic Way. On the west, the Atlantic is demonstrating its prowess and on the east a wonderful beach and a picturesque harbour nestle in the protection of the bay. This is one check point along the Wild Atlantic way which you can tick of your bucket list! There is still lots to see on your way back towards Enniskillen, we recommend stopping in the seaside town of Bundoran for a stroll along the beach or to discover the wonder of the Fairy Bridges. The stunning Fairy Bridges or sea stacks are thousands of years old, and a star attraction of the Wild Atlantic Way Coastline. With scenic views for 360 degrees you can see back to Mullaghmore, County Sligo and across Donegal Bay to the magical Slieve League Cliffs. This is the playground of the legendary Little Folk, which coupled with the spectacular formations spanning the edge of the roaring ocean, prompted the local name “The Fairy Bridges”. While you’re there, take a seat on Bundoran’s own Wishing Chair. 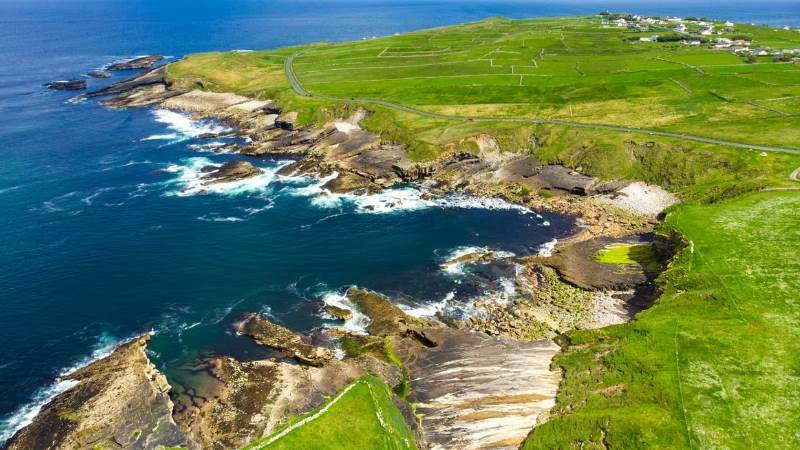 It is said that many of the town’s famous visitors over the years have sat here overlooking the wild Atlantic Ocean – from poet William Allingham to golfer Christy O’Connor Jr. Sit, make your wish, relax & enjoy your time in Bundoran. Drop into Dicey Reilly’s Pub and bask in the welcoming atmosphere of this traditional Irish Bar. With a large selection of local craft beers and live traditional music, this is the perfect place to unwind after an afternoon exploring. The Boatyard Distillery is an award winning farm-to-bottle distillery located on the banks of Lough Erne in North West Ireland. Founder, Joe McGirr, has utilised his background in spirits and whisky knowledge to build his dream of the first legal distillery in Fermanagh in over 130 years. After a busy day exploring the area, retreat to the sanctuary of Killyhevlin Lakeside Hotel and dine in the award winning Kove Restaurant , perfect for Foodie Lovers. Head Chef, Kevin Watson comes with a wealth of experience and adds his own culinary creativity to each and every dish he produces. Kove is a proud member of Good Food Northern Ireland and this is reflected in the restaurant's menu which offers a varied range of wholesome yet innovative dishes prepared from only the freshest local produce and served with great care and attention to detail.